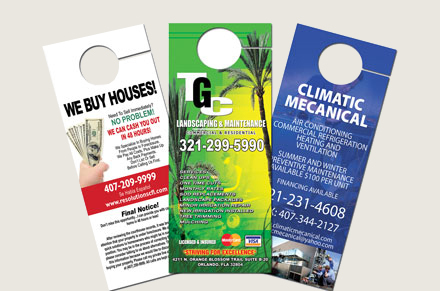 Door hangers are the most effective way to market to a main focus demographic. You can place Door Hangers on door knobs of houses, stores, offices, and apartment complexes in your target market yielding great response at an astounding rate. Our final price includes die-creation , die-cutting, as well as all finishings. Door hangers are typically printed on one side, but we can print on both sides at no extra cost to you.